What is the difference between Flash client and HTML5 chat client? HTML5 Chat has significantly improves the performance for 123 Flash Chat and works beautifully on iPhone, iPad, Android Devices and PCs. The loading speed is much faster than the Flash client; Flash player will not play a crucial role anymore since HTML5 chat will load your chat even without flash player installed. More chat plugins are introduced into the HTML5 client to make the chat more fun and appealing, such as marquee messages, bid sofa, Facebook fan, Facebook like, Twitter, games, YouTube. etc. 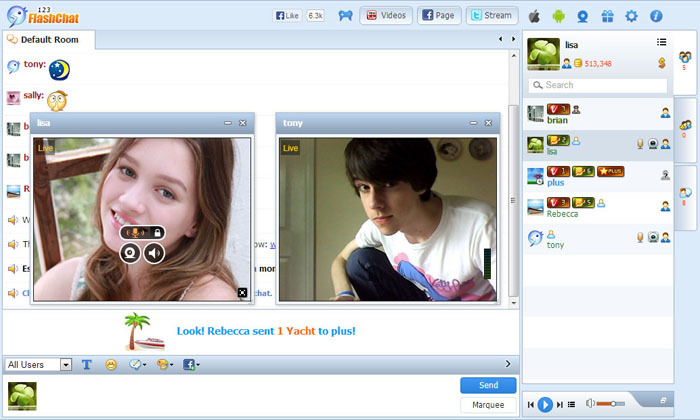 123 Flash Chat 10.0 has enriched the HTML5 client with the media player brought in. You can play music, video or youtube clips in the room and it will genialize the chat and make it charming. Media player can be minimized, maximized and displayed in full screen. Repeating/previous/next is realized for the playlist. Auto resizing is realized, media player will be minimized when height is dwindled to a set value. Admin/moderator can enable the moderated chat mode now in HTML5 client. 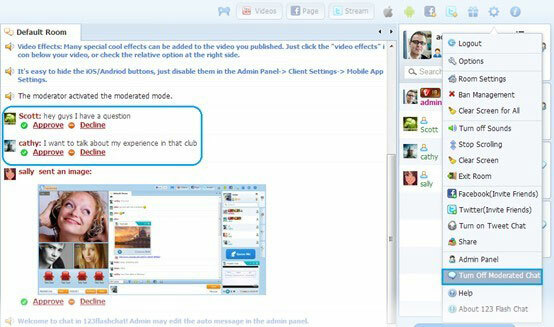 It used to help to great extend to control the chat in flash client now the same will go to the HTML5 client as well. User list position can be changed in the admin panel, right or left. One attractive perk by utilizing HTML chat will be its compatibility in different clients. It works beautifully on pc, iphone, ipad and android devices. Such compatibility will definitely facilitate your webmaster, your users and yourself. Though there are still debates if HTML chat can be totally in lieu of flash chat, no one can overestimate the prowess of emergence of new things. No more flash, no more java or ajax, everything will be in pure HTML soon. Check below links for more HTML5 client features.